There exists many ways of analyzing the relationships between co-authors in Academia. In this blog post, I will talk about a fun measure called the “Erdös number“, which has been proposed in the field of mathematics in the 90s. The Erdos number of a person is the distance to Paul Erdos when considering co-authorship links on academic publications. For example, if you have written a paper with Paul Erdos, you have an Erdos number of 1. If you have written a paper with a co-author of Erdos, then your Erdos number is 2. And so on. The concept of Erdos number is based on the concept of “degree of separation” between people in a social network. The idea is that everyone should never be very far apart from any other person through their social links. Maybe you wonder Why using Erdos as reference for this measure? The reason is that Paul Erdos is one of the most prolific authors in mathematics, with more than 1000 papers. 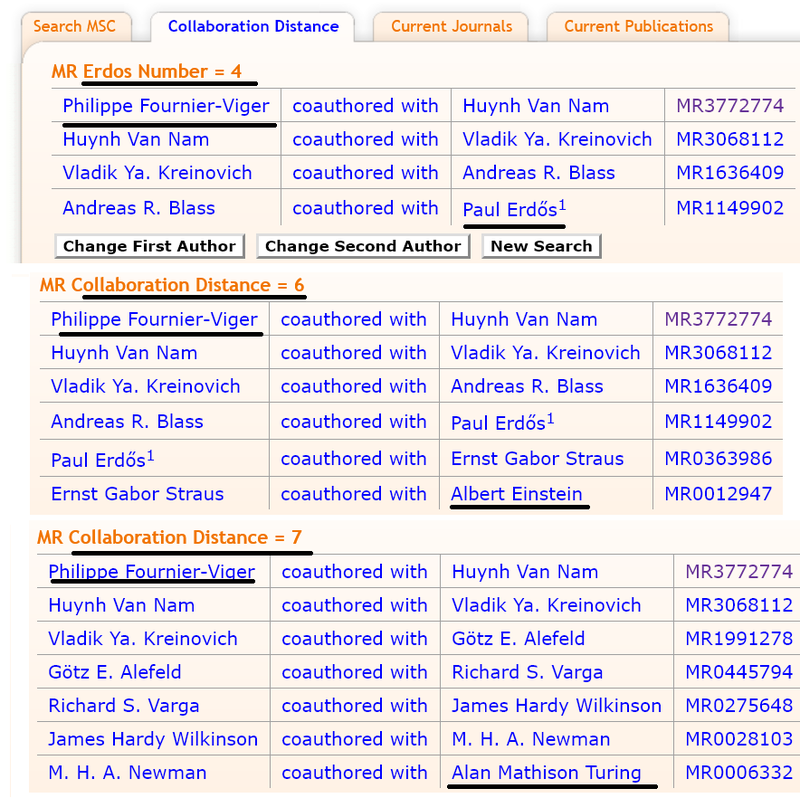 Thus, Paul Erdos is widely connected to other researchers. But other people can also be used to compute such numbers. Thus, according to this tool, my Erdos, Eistein and Turing numbers are N = 4, 6, and 7, respectively. If you have collaborated with me, and upper bound on your numbers is thus N+1. All of this, does not mean much as our contributions to sciences are much smaller than those of these geniuses. But it shows that researchers are often not far apart. This was just a short blog post to show you this interesting tool for calculating the distance between researchers in academia. It is not a new concept, but I think it is interesting. It shows that indeed people are never very far apart in academia. What is your Erdos number? You can share it in the comment section below!